In 2010, federal spending included $536.7 billion in contract awards, $557.7 billion in grants, and another $357.5 million in loans and guarantees. Of this, the largest portion of the dollars went to the Department of Defense (DOD) at $367 billion, followed by the Department of Energy (DOE) at $25.7 billion, and then NASA at $16 billion. In Contrast, in 2014, federal spending included $443.3 billion in contract awards, $589.1 billion in grants, and another $6.4 billion in loans and guarantees. Of this, the largest portion of the Contract dollars went to the Department of Defense (DOD) at $283.6 billion, followed by the Department of Energy (DOE) at $25.4 billion, and then NASA at $15 billion; a total decrease in Contracts spending of $93 Billion dollars – of which $84 Billion was in DOD. 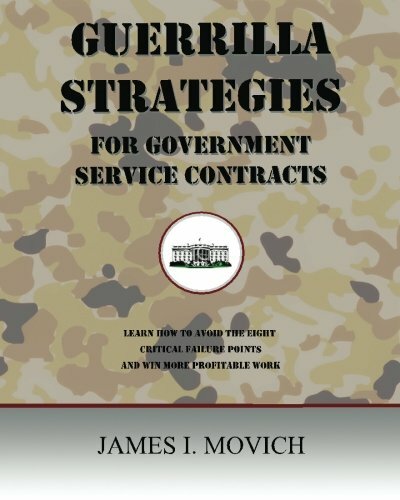 This 8×10 full-color, illustrated book is written for the Government marketing executives and proposal professionals with an existing and fairly developed understanding of the field of Government contracting. Book one in this series is written for those who are just starting out or have only a rudimentary understanding. This book contains advanced strategies and techniques for winning Government service contracts. It is intended to get people thinking about developing and implementing those strategies and how to best accomplish the job of business development for Government contracts other than the traditional ways they may have been taught. This book is intended to be both provoking and controversial. You could also say that one of the purposes of this book is to hunt sacred cows. I point out important tips, ideas, warnings, reminders, technical issues, and actions for you to try out for yourself. I adopted the catchphrase “Don’t Get Eliminated!” Because so many companies in Government contracting don’t really lose to their competition; they eliminate themselves by committing clumsy, inept, stupid mistakes or outright illegal actions, either in full awareness or unwittingly. This book will help you to avoid the eight most common of these mistakes, and by doing so, your win rate will increase, and you’ll be able to add more profitable work to the company’s resume.